It’s been years and practically a rumor that a fourth Mad Max film was in the works. Hell — a few years ago some friends and I convinced some people at Comic-Con that Stephen’s car was from a new Mad Max movie. But that’s besides the point. 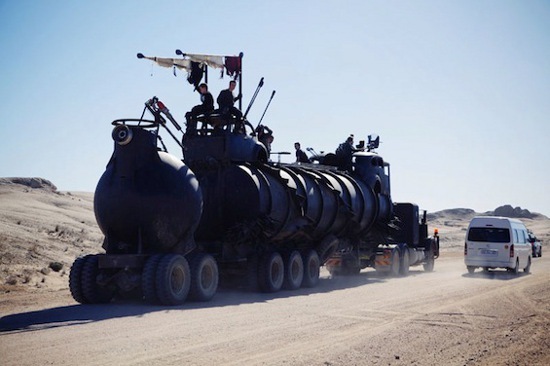 Photos surfaced online of George Miller’s Mad Max: Fury Road, proving that production really is moving forward. No, Mel Gibson is not reprising his role, but Tom Hardy will take over the reigns as the titular character. Joining him is Charlize Theron — who, as of late, seems to take roles that film geeks would enjoy. The only thing known about the premise is that it focuses on Max protecting the “Five Wives” from wasteland gangsters who want to take down their caravan. I wouldn’t doubt that it has something to do with fuel. Judging from the photos, it looks like a safe assumption. Normally I’d feel apprehensive about a new Mad Max film years later, but if any actor can carry the torch, it’s Tom Hardy. You can view more photos from Mad Max: Fury Road HERE.